A meeting of PDP Governors Forum and some other Party stakeholders held yesterday being Thursday, June 15, 2017, at the Residence of the Chairman of the Forum and Governor of Ekiti State, H.E. Chief Ayodele Fayose. 2. The Meeting was well attended and it had the Governors of Akwa Ibom State, Mr. Udom Emmanuel, Gombe State, Dr. Ibrahim Hassan Dankwambo, Delta State, Senator Dr. Ifeanyi Okowa, Bayelsa State, Hon. Henry Seriake Dickson, the Deputy Governor of Rivers State, Mrs. Ipalibo Banigo, and the host Governor, Chief Ayodele Fayose. Other Party leaders include: Professor Jerry Gana, Senator Chief T. A. Orji, former Governor of Abia State, Chief. Achike Udenwa, former Governor of Imo State, former Ministers of Women Affairs, Hajiya Zainab Maina and Hajiya Inna Ciroma, and a host of other Party stalwarts. 3. The Meeting according to Governor Fayose, resolved to remain confident, committed and loyal to the PDP believing that the Party which is more democratic than any other in the Country, will be united towards winning elections at all levels in 2019. 4. 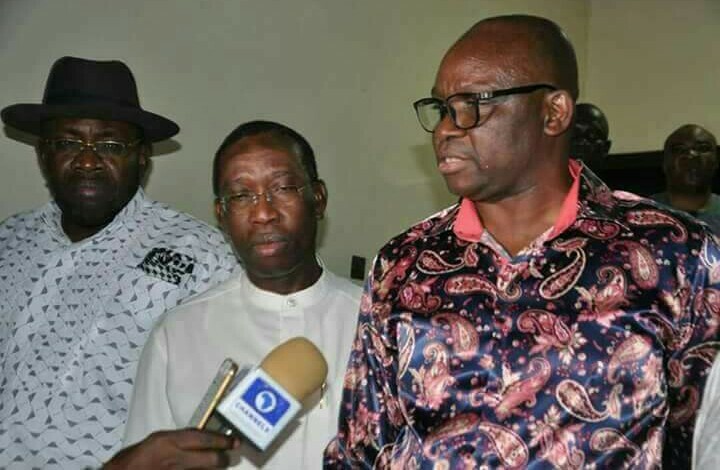 On the pending Appeal at the Supreme Court, Governor Fayose stressed that the Party leaders are hopeful that the forthcoming Judgment will further unite the Party. To buttress, he declared that the Court Outcome will be that of no winner and no vanquished position. 5. Concluding, the Chairman further maintained that the PDP is beyond every member and as such, all its members must be guided by its supremacy. He reassured Party members of their continuous agreement to work together for the overall success of the PDP and democracy.